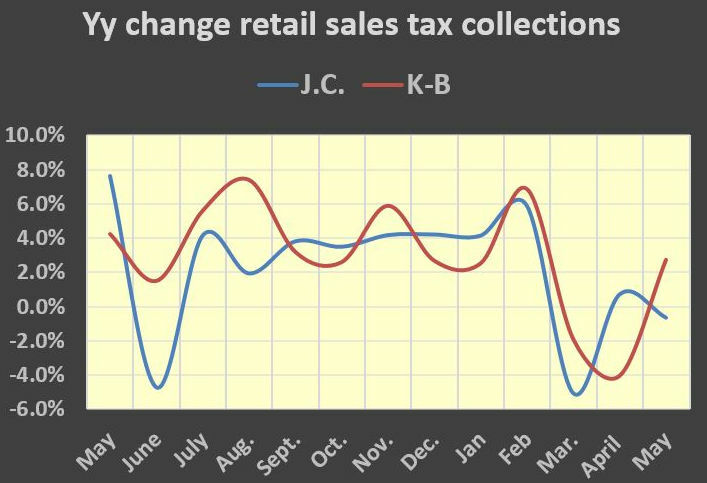 Kingsport-Bristol retail sales tax collections bounced back from two months of negative performance for a solid 2.7% year-over-year gain in May. At the same time, Johnson City Metropolitan Statistical Area (MSA) collections cooled with a 0.6% decline. Kingsport-Bristol’s May over April performance was also the best in the state, up 9.1%. All of the Northeast Tennessee MSA enjoyed better performance than last year except the three-county Johnson City MSA. May was a continuation of mixed Tri-Cities economic signals. Johnson City MSA continues to see stronger job and private sector wage gains than the four-county Kingsport-MSA while the Kingsport-Bristol housing market is showing stronger sales and average price gains than Johnson City. There is antidotal indications Kingsport-Bristol’s housing growth is benefiting from Johnson City metro area residents looking for more affordable housing and Coalfield residents relocating for better employment opportunities. According to May’s seasonally adjusted retail sales tax collections report from Middle Tennessee State University’s Jones College of Business, collections statewide was 6.4% higher than May last year. Tri-Cities collections were up 0.3% from May last year but are still underperforming the stable trend pattern that began July last year and continued through February before falling off the cliff. May’s collections also returned the share of collection to a more normal pattern. Johnson City claimed a 48.2% share of the total. Nationwide, shoppers boosted retailers by 1.2% following a disappointed April. The Commerce Department’s retail sales report showed auto sales up were 2.7% – the biggest gain since November. Clothing stores, department stores, health and beauty shops, sporting goods and grocery stores all increased in May while furniture and building supplies declined. Consumers play a significant role in the vigor of the economic recovery because their spending accounts for roughly two-thirds of all economic activity. Retail sales also account for 40% of consumer spending. Following your trend reports is an excellent way to keep my finger on the pulse of the surrounding areas. I just wish they were available when I was heavily invested in the business/public sector; nevertheless, still very relevant as a private citizen. Kudos.